Revival starts with one person. You. Charles Finney who shook up nineteenth-century America with his preaching, earned the title Father of Modern Revivalism, and became the forerunner of revivalists like Dwight L. Moody and Billy Graham knew a thing or two about revival. And he claimed it began not in the emotion of the masses but in the repentance of the individual. This new journal edition of a spiritual classic invites readers to record their reflections, thoughts, and prayers in response to Finney s fiery words on how to experience revival. As you let his message soak in and interact with your life, you might find revival to be closer to home than you ever expected." 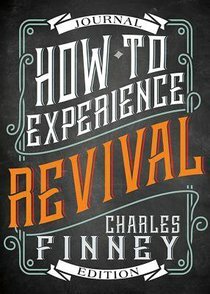 About "How to Experience Revival (Journal Edition)"
Charles G. Finney (1792-1875) is recognized as the most effective evangelist of the 19th century. It is estimated that more than half a million people were converted to Christ through his evangelistic ministry. After becoming a lawyer he carefully explored the claims of Christ and was powerfully converted in 1821. An avid student of the Bible, he soon engaged in preaching and teaching throughout many eastern and southern states. The result was a revival which altered the course of American history, it is estimated that more than half a million people were converted to Christ through his evangelistic ministry. In 1835 he accepted a call to Oberlin College as professor of theology, serving as president from 1851-1875.-Editorial Review.